Please fill up the form below to enjoy our FREE TRIAL. Shinjiru website builder is an all-in-one website creation solution that allows individuals to create websites without complicated code! Our website builder comes with over 100 beautiful templates that can be customised with total design freedom. Once done, simply click ‘publish’ and you’re online! Creating a beautiful website has never been so easy! Affordable web design services from a team of professionals! Choose from 60+ templates. There are templates to match every industry! 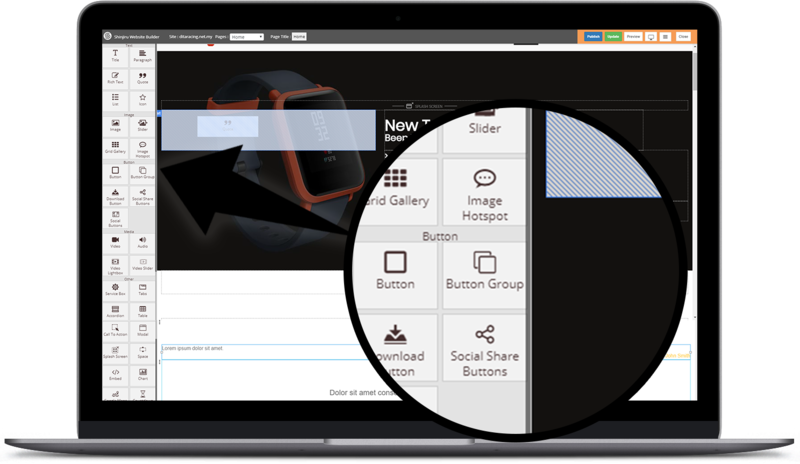 Drag photos, drop photos, amend text and use widgets from a user-friendly interface! 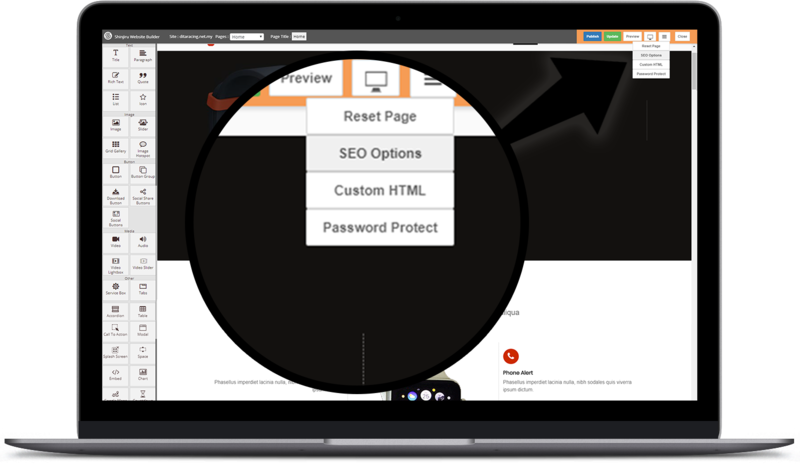 Add your SEO keywords, finalise your website across desktop and mobile devices! 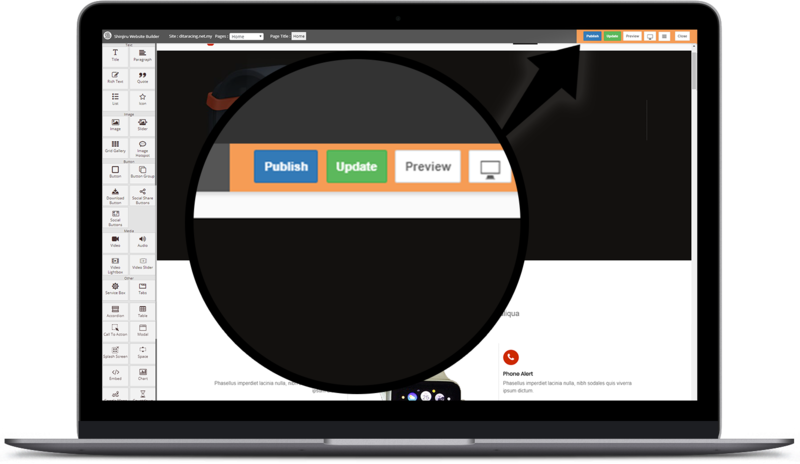 Click publish and see your beautiful website online in seconds! Widgets are ready made actions that can be dragged and dropped into your website. Drag a map locator, drag a contact form or even drag a gallery section. With such a huge selection of ready-made widgets, create and manage websites with ease. Having partnered with Ecwid, one of the most famous e-commerce and online store solutions on the market. E-commerce can be enabled out of the box and is fully responsive and beautifully displayed across all desktop and mobile devices. Have an existing website but need the content for your new website? Simply pull your existing web content into your favourite template with a few simple clicks. Content can be extracted from any website and from your Facebook page. Our website builder is SEO friendly, such SEO requirements like Robots.txt, Sitemap, Open Graph Support, Vary: user-agent, Page Titles, Meta Keywords and Descriptions, Customisable Page URLs, Alt and Description Tags on Images and 301 Redirects are all ready to use. Every website built on the platform is hosted on Amazon’s worldwide Content Delivery Network (CDN) and averages a 99.9% uptime. This means your website will always load quickly, and you’ll never have to worry about your website going down. Images are optimised to fit all devices to ensure your website is beautiful wherever it is displayed. 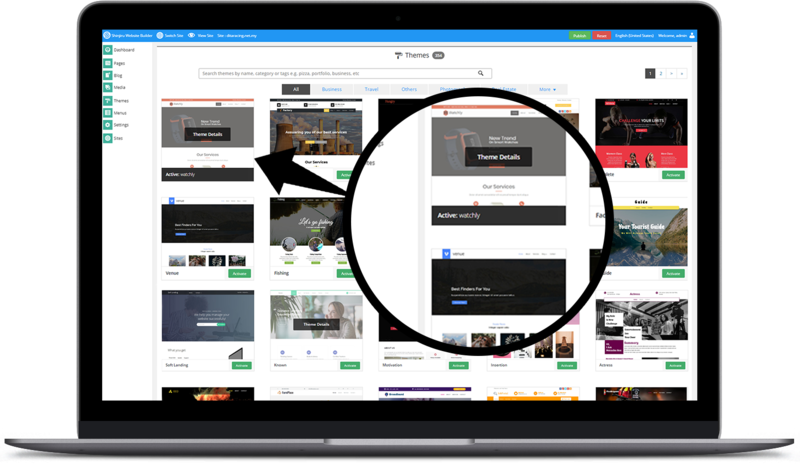 If you have content that is unique for desktop audiences and hidden for mobile audiences and vice-versa, our website builder can customise that for you from the easy to use device editor. Though it sounds a little complex, the concept behind DWP is fairly straightforward: it’s all about creating a website experience that directly relates to a visitor’s unique situation. This is accomplished by changing the messaging and content of a site based on things like time of day, number of previous visits to the site, visitor’s physical location and more. Create mobile website previews, including ones that show a side-by-side comparison of customers’ current and new mobile websites, featuring your branding. A website is now a must-have for doing business in today’s world, a website establishes trust and reputation to the everyday consumer and is also a brilliant vehicle to convey information about your business! With our website builder, building a website has never been so easy, no knowledge required! Our Web Builder has optimised websites published on the platform that is geared to score highly on the Google PageSpeed test. This test looks at many technical factors of how web pages are built, and checks to see that they fit the best industry practices that enable websites to load quickly. The most important check in the Google PageSpeed test examines how the website code is structured. Google checks to make sure that the code is structured in a way that allows the browser to load the content fastest. Enrich your websites with a huge selection of business-driving widgets that are easy to use and customize. You’ll find everything from icons and buttons to restaurant menus and image galleries. Depending on your requirement, there are available popups pre-built in the website builder that can be used to promote sales, encourage email sign-ups, or even personalise the site for specific visitors. A customisable easy-to-edit Contact Form is available and ready-to-use. It has many layout and style options, as well as easy integrations with MailChimp, Constant Contact, and Google Sheets. Help your customers stay in touch with their site visitors, even when visitors are not on their site, with Chrome Push Notifications. Let website visitors know when a brick-and-mortar store is open and when it’s not. Save time by importing and then editing business hours from an online source. Enable customers to call a business with a single click from a mobile device. Enable visitors to email website owners directly from their websites. With vCita, site visitors can schedule appointments via desktop, tablet and mobile. With OpenTable online reservation service, site visitors can make restaurant reservations. Drag and drop coupons onto a site and control the discount, duration, etc. Make it easy for site visitors to engage with a site and send feedback with this online commenting platform. Add beautiful, customizable dividers to your sites. Choose from a variety of layouts and designs. Enables website visitors to download PDFs, spreadsheets and more by clicking a button. Allows visitors to comment on a linked Facebook page without leaving the website. Enables you to add a gallery of images from a Facebook business page. Enables visitors to like a business’s Facebook page without leaving the website. Choose from a library of more than 1,000 icons, or simply upload your own icons then use them to customise your website’s look and feel. Create a beautiful list of anything you like, from products and services to team members. The list can includes titles, descriptions, images and image links. Powered by Mapbox, choose from several sleek layouts, and make it easier for site visitors to find your customer’s brick-and-mortar location. Insert a map powered by Mapbox that shows multiple locations and enables website visitors to find the location closest to them. Make it easy for site visitors to shop at your site or make a donation with a customizable PayPal button. Save time when building a restaurant menu by syncing with a menu that’s already online and then editing as you like. You can integrate images, change the item order, customize the layout and more. Incorporate blog posts from another URL directly onto your website. Make it easy for site visitors to share the website on social media networks including Facebook, Twitter, LinkedIn and more. Add links to social media pages including Instagram, Reddit, Snapchat, TripAdvisor and more. The icons are neatly arranged, easy to customize, and can be dropped anywhere on a site. Keeps site visitors up-to-date by displaying a live Twitter feed. Build credibility with website visitors by displaying top Yelp reviews directly on your customers’ websites. Save time with our tag-based widget search, which makes it easy to find just the right widget for a website. With over 100 templates and more being created every month by a professional team of designers. A beautiful and fully responsive website is just a few clicks away. With templates to suit every industry, you can create a website and have it online within a few hours!